Are, unfortunately, not the only “symptoms” of the male midlife crisis. The male midlife crisis affair may still be a cliché, but it’s real. It happens all the time, and though you still can’t believe it, it has happened in your marriage. Did you ever imagine this could happen in your marriage? Did you ever think that some day you’ll wake up next to your forty/ fifty-year-old husband and discover he is dating a woman half his age or his ex-girlfriend from high school – behind your back? Your whole life seems to be falling apart, piece by piece. Why and how did he start his “midlife affair”? What does his age have to do with it? Will he leave you for or has already left you and you still hope that it’s just a “phase” he’s going through? In this post, I’ll try to answer all of these questions and maybe convince you that this doesn’t mean your marriage has to be over. But first, what’s different about the male midlife crisis affair? What’s Unique about the Midlife Crisis Affair? But it definitely seems like men start hitting the gym more often, buying an expensive bicycle and fantasizing about pretty young things – while women become depressed, go through hot flashes and gain weight. There are dozens of midlife crisis “symptoms”, but the one that is most connected to the male midlife affair is the attempt to recapture youth. Recapturing youth for men includes a rediscovered worry about appearance, contacting ex-girlfriends on Facebook and becoming excessively nostalgic (among other things). And what’s the most obvious (and exciting) way to recapture your youth? A thrilling, exhilarating, action-packed, stimulating and intoxicating new love affair. Preferably with a woman half his age. A 2014 study revealed that both men and women are the least happy around 44 years old. In the U.S, the lowest point for guys was at 50. And, midlife men often “turn tender” and start to focus more on people and feelings, but ironically this makes them more easily drawn into an affair. In any case, your husband’s midlife crisis affair is in no way your fault. HE chose to break his vowels. Not you. 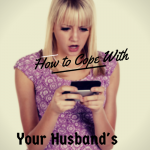 In my experience, most women try to ignore their husband’s midlife crisis. They hope that it’s just temporary and soon enough, it will go away on its own. But a midlife crisis affair can hardly be ignored. Right? Your broken heart screams “run away! Leave him! Now! But your mind interferes and reminds you of a lifetime of friendship, kids raised together, mutual friends, a life you built together as a family. Deep inside you hope that his midlife affair is just temporary. Soon he’ll realize the huge mistake he has made, leave her and beg for you to take him back. Will it last? How long will it last? Could he be really in love with that woman? Is it worth ending the marriage over? Affairs, in general, tend to follow a general pattern, and the male midlife crisis affair is no different. Have you ever imagined what it would be like to start a new love story after all these years? The excitement, the hot flashes, the fantasizing and daydreaming? The sense that there’s someone new admiring your looks, your sense of humor, your smile. Someone who understands you (without knowing your weaknesses), who thinks you’re the best person on earth? I’m sure you can imagine it, so now you know how the first stage of an affair feels like, and why it’s so hard to let it go, no matter what it compromises and who it hurts. It’s a sharp contrast to the pressures and stress of daily life. It’s addicting. Then the affair settles onto a second phase – routine meetings, emails, texting/sexting, and phone calls. At this point, the focus shifts towards the affair partner. After all, she’s new. He doesn’t know her flaws yet. The heat and passion of a new love affair can make anything else look dull and lifeless. Your husband (mistakenly) thinks that this is the best relationship he has ever had. To support this thought, he will rewrite history and may convince himself that he never really loved you and that he never wanted to get married. At the same time, he knows that if he stays with this woman, he will lose living with his children, mutual friends, and some extremely needed cooking, laundering and cleaning “services” provided by you. Plus, he could be rejected by his extended family and face anger and resentment from his children. At this point, he will decide whether to end it or to choose the “cake eater” route. He genuinely desires to be with both of you. The other woman provides some needs, and you provide others. And he wants it all. The “cake eater” can stay in this phase for years, until you find out. When you find out, he is forced to make a decision: end the affair and heal his marriage, or leave everything behind for the other woman. If the affair lasts long enough without you finding out about it, the cheating spouse enters the heavy confusion phase. The guilt feelings (yes, he has those) about destroying his marriage, the constant lies and betrayal start to take a toll on him. Not only does he lead a secret life, but now he starts to get demands from the other woman. She wants more and more. She may threaten to tell you everything. He feels an urging need to make a decision: end the affair, come clean and try to salvage his marriage? Or leave you and his children for a woman he can’t imagine living without? And the guilt keeps grinding. Emotionally and physically. This phase usually determines the outcome of your husband’s midlife affair. It will determine how long it will last and if it will last, and whether he will leave you for her – or not. If you think about it, the longer the affair goes on without you knowing about it, the more chances he’ll eventually end it and beg for your forgiveness. Coping with your husband’s midlife affair depends, of course, in your current situation. A temporary separation, handled in a smart way, can actually save your marriage rather than end it. Here’s what to do if your husband has left you for another woman. 2. If your husband still lives with you and refuses to make a decision (asking you to wait for him to decide) – Do not beg and plead. You don’t want him to choose you and your family only because you begged for it. His decision won’t be real and won’t keep for long. If you had a rough marriage before his affair, the midlife affair could be the final blow. But it doesn’t have to happen. If he can’t decide, I would decide for him. Here’s how to use marriage separation to save your marriage. 3. If he begs for your forgiveness and ends the affair – if your husband shows real and true remorse, ends the affair immediately (in front of you) and begs for your forgiveness – there’s a chance that his midlife crisis affair is really over. In this case, chances are he is returning to earth with a hard landing. It may seem weird to you, but a smart woman would focus on herself at this point. Put all your energy into you. Get new clothes, get a massage, go out with your friends, discover yourself again, and find your calm and balance. It’s a critical step in saving a marriage after an affair. Then, go on to deal with your marriage crisis. I would start with restoring your trust in him through the post-affair agreement. The male midlife crisis usually happens to people between the ages of 35 to 50 who have a very stressful life, with too much responsibility and too little fun and leisure time. I believe that the way you cope with it will determine whether his midlife affair will end your marriage, or surprisingly make it stronger in the long run. If you can lift yourself up, and not let the anger, frustration, and sadness take over you, your marriage can make it out of the storm and possibly become better than it ever was. Great insight and data into the male midlife crisis. Not being currently married I do not have firsthand experience but much of what you said does happen to some extent in every marriage. Visiting you from Messy Marriage today. Great post. I dealt/am dealing with this entire situation this year. And this offered really great insight that was very helpful to hear. How did it unfollow? I’m dealing with this right now? I knew what my husband was doing and it was not just hurting me but our children as well. The things my own husband has done and keeps on doing makes me so sick to even say that is my husband why because of the way my own husband has treated me and the children. Like we are nothing but his slave to do his bidding. This is not how a marriage is to work in my book. It is to people that love each other that would do everything and anything for each other but yet my own husband see’s it differently. My own husband said what I do is my own business and I am not to ask any questions. That is why I got to hide my money and get out of this so called marriage that is not a marriage to me but a death wish for myself. Why because no one should ever be treated like I have from my own husband. Like I am his animal at his will to to what he wants when he wants it. No one should be treated this way. So after finding out, I lost it. Got completely emotional, begged him to come back to me when he said he was going to stay at his parents for a while. Then came the back and forth…him leaving to his parents, coming back, me staying with him at his parents (we were living with my Mom at the time) and then both of us coming back, him still showing no emotion even when he used to be so full of emotion. Him rekindling the affair. Me finding them at a hotel together and literally throwing get his things on the front lawn and losing it all over again. I just want my husband back, not this jerk who looks like him. I know it’s a midlife crisis not to mention he’s a recovering alcoholic who decided to put his sobriety before anything else when this all went down. I’m grateful for his sobriety but don’t understand why everything comes before getting help for our marriage. I still love him. I can’t turn it off like he has. I want our life back. I can’t talk to him right now because I feel he doesn’t deserve to talk to me after all he’s done. I tried being the supportive wife but unfortunately read this article after doing everything you basically said not to do. My entire world is falling apart and I don’t know what I’m supposed to do. Move on and let him go? Wait it out and hope for the best while he spends our money on her? Close our joint accounts? Do I just wait for something that may never happen? This is killing me. I never in a million years thought I would have to deal with this. Not me, not my husband, it wasn’t supposed to be this way. What do I do now? I think that if you want any chance of recovering your marriage, you’ll have to let him go. At least for a while. We can’t force someone else to do anything we want, we can only see the situation clearly and decide where we go from here and what we do in this situation. If you don’t want him to spend your mutual money than do what ever is necessary to prevent it, even it means closing your joint accounts. That can be reversed in the future. You don’t have to turn anything off, and believe me, he hasn’t “turned off” his feelings for you either. He still loves you and now it’s covered up with a ton of guilt. Do what ever it takes to restore your self esteem, to feel good about yourself again, and make this your primary focus at this point. You have to do that to clear your head so you will be able to hear your inner voice, your truth. You’ll know what to do and how to do it once you are able to calm down, to see clearly again. Not before. Don’t make any decision while being angry and sad. You will most likely regret them. Give yourself some time to reduce stress, and than decide what to do. I’m glad I found this website. I am currently struggling to deal with my husband who is having a Midlife Crisis Affair. He works with this woman who is married. I have asked him to get a new job and he refuses. I believe he stopped seeing her for a while. He became sad, depressed, had lots of anxiety and was in so much pain. We had been going to couple’s therapy together but he has now started going alone because of many issues he has as part of the MLC. I noticed that recently his mood had improved somewhat and I couldn’t figure out why. Then last week he went to his first individual therapy session and he once again became overwhelmed with emotions as he described it. I asked him about it because he was never so overwhelmed after the therapy when we went together. He said he has been feeling guilty. He’s been thinking about leaving, separating. He’s been looking up divorce. Can’t make up his mind about our marriage. He says he loves me but is confused. I asked him how much of this has to do with the other woman. He said it was not about her and they have been professional at work but his face told a different story. At that point he couldn’t deny it anymore because I told him he was not credible. His face gave him away and he did not deny they have restarted the relationship. Certainly we argued. I think he was looking for relief from the emotional pain and she feeds into his midlife crisis. She tells him everything he wants, that is selfish is good for him. What do I do? Sometimes my husband wants to be close to. me, other times he pushes me away. How do I live with a man who is having a relationship with another woman. How do I get him to leave his job? I think you won’t be able to tolerate this for much longer. I would let him leave if that’s what he wants, because we can’t control anyone and even if you get him to stay and leave his job, he will still feel the same for this woman and you’ll know it. You probably know deep inside that this has started with some trouble in your marriage (it always does). Maybe some time apart will allow both of you to see a better relationship between you two, than you can do via couples therapy. I hope this helps, and remember – it’s just my opinion. My husband was having a five month affair with a work colleague when I discovered it on his phone six weeks ago. He left to go to his parents, then became guilted by them to come back. That lasted a week and the pressure and atmosphere became so unbearable I made him go back to theirs again. He hasn’t seen her since but admits he still has strong feelings for her. He has lost a lot of weight and is deeply depressed and anxious (guilt and self pity in my opinion). I had an urge to beg him and tel him things will be different if he comes home. I called him selfish and tried to make him feel as guilty as I could. He has ended our relationship saying he can’t give me what I want, which is a reconciliation and for us to work at things. From reading your threads I told him I’d no longer seek contact with the other woman, that I didn’t want to be angry anymore, and that he was right to leave and for us to separate, as our relationship was in no state to repair itself. I’m currently trying to set boundaries for contact with our two young children, have made plans with friends and joined a gym. Do I demand he takes all of his belongings and make things more definite, or just let things lie? I think you’re doing great, and I think that if you stick with it, and just concentrate on yourself and on being happy no matter what he does and says – you’ll get everything you want, and this will be the storm that eventually will make your marriage better than ever. Thank you. I’ve no doubt the two of them are still in some kind of contact, which is horrendously painful. I will maintain what I’ve been doing no matter how hard it is. I struggle with having no control but I see that I cannot make him come back. He has to want to come back. Will the affair just fizzle out? 5 months ago I found out my husband who is almost 50 was having an affair with an 18 year old at the time. When I found out he promised it was over. I fought with my emotions for weeks. I tried dealing with the hurt and deceit. I lost over 30 lbs and had become extremely depressed. This man meant the world to me. How could he do this?? Of course I blamed myself. My looks, my attitude, everything so I changed by being more patient, more loving, more caring. I did everything I could think of to let him know I loved him. We had booked a family vacation to Brazil and he decided we needed that time to reconnect. The second day there I find out the affair isn’t over. I find texts, sexts, naked pictures, emails, you name it. For my sons sake I sucked it up for the vacation but I was miserable inside. As soon as we got home I dove back into the same feelings and depression as before. He suggests he is going through a midlife crisis but I just can’t get past the hurt and the way I am feeling. I don’t want a divorce but I dont want to be treated this way. His family is a wonderful Christian family and he once was too. I don’t know who he is anymore. I just want my husband back. I have no idea how I will ever get through this. Having an affair is just not ok, especially with an 18 yr old girl. I’m so hurt and confused and don’t know what to do. I found out about my husbands 4 year affair after we were married for 34 years. That was August 2017. It sounds exactly as described. He never wanted to end our marriage, he wanted us both, he wanted to end it when she became too demanding and wanted more. He told me all this when she called me and outted them. He swore is was over, for 8 months I struggled with the heartbreak and disallusment. Then she emailed copies of the emails they exchanged since D day. Him begging her not to come to me, that he wanted to keep her in his life etc. He says he was so afraid that we wouldn’t make it and he didn’t know what or who to talk too. He admitted she was a backup plan, but says he never would have stayed with her. His therapist thinks it’s a mid life crisis affair. So what do I believe now? Again he swears it’s over. How do I know, feel safe and move forward into forgiveness and trust? The truth is that there is no way you can know. It comes down to a decision: either think about the worst-case scenario, prepare for it, and then of course watch is materialize into reality, or decide to trust, leave the past behind, feel safe anyway and try to forgive, and see what happens. It seems to me that if you take the positive route, you don’t really have anything to lose. At least you would be able to tell yourself that you tried everything to save your relationship, and you may enjoy the “side effect” of being happier and more calm. This is the decision to make. What do you think? Thanks Lisa for posting this page. Everything you mentioned makes a lot of sense and match up to my recent experience I have with my husband’s affair with a young girl half his age. I was very devastated and completely tore up inside when I found out. It’s very absurd and beyond ridiculous. We’d been married for almost 25 years. I think this was a midlife crisis for him but I never thought he would do such a thing. My husband told me he was done and wanted a divorce two months ago. He said he needed to figure out if he could do things on his own or he would regret it. He also told me I had a drinking problem, which in some sense is true. He was never home and I drowned myself in wine. So, I started making small changes: going to therapy, stopped drinking wine, going out with friends to Panera or even just hanging out a Barnes and Noble by myself. We continued to live in the same house because he refuses to leave. We were being amicable and I was trying to be kinder and listen to his needs and emotions. Meanwhile he continued to hang out at a local bar with people who are less than stellar….who he has always said are below his level….but NOW they are his friends? Two weeks ago, I found out he was seeing another woman…who is also at the bar ALL OF THE TIME. He told me it had been since January when we “separated” but I have heard from others it has been much longer. In hindsight, all of the signs were there I guess I just chose to ignore them. I asked him to go to mediate for the divorce with me, but he refused. I got the paperwork as the attorney I first consulted with told me to have him fill out the paperwork and he would look it over with me to see if it was fair. Husband put it in a drawer and didn’t look at it again. WELL…..I saw them driving together and lost my mind. I filled out the paperwork and told him we were done. It turned into a HUGE argument with both of us, well mostly me, saying mean things. Since then I have retained an attorney and he will be served with a letter to “mediate or we will begin filing” tomorrow. I was really trying and was doing a great job, but feel he was having his cake and eating it too. I feel like I was an option, not a priority. I feel betrayed, disgusted, shamed and most of all hurt beyond believe. To all of you who hang on to a man in MLC….God bless you. All I can hope is that he comes to his senses at some point and realizes what he has done to his family.